With 75 daytime and 101 evening guests attending the average wedding, you need someone to help keep things in check on the big day whilst you mingle with family and friends. This is when an organised bridesmaid is a good person to have around! She’s one of those people who is naturally organised — she bought you your own wedding planning book but probably used it more than you. This bridesmaid will be the first to make sure everyone is the right place for photos and gathering guests around the dance floor for your first dance. Once the wedding day is over, you’ll wonder how you could’ve done it without her! She's fab. Let this bridesmaid come up with the theme of the hen do, she’s creative and hilarious and will organise a night that’s guaranteed to get your bridesmaids to know one another. Although some brides tend to want the speeches at the wedding breakfast to be romantic and a bit soppy, the guests want some entertainment! You should let your comedienne bridesmaid make a speech on your big day (or at least let her help write it) – she’s got the funniest memories to share and has a way with words that is guaranteed to make your guests giggle. She’s a serial bridesmaid and has seen it all before. 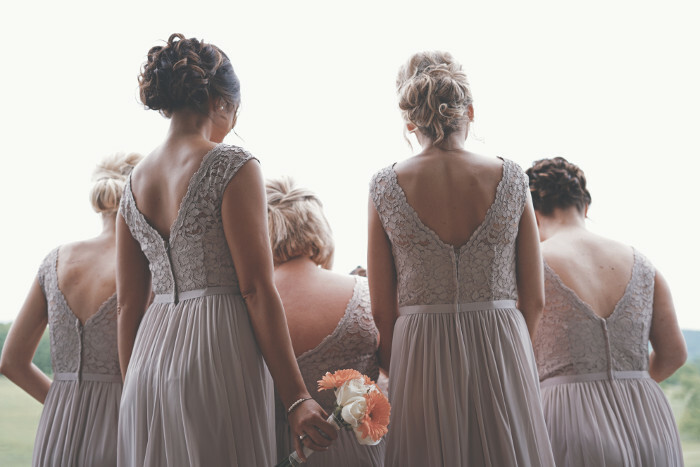 This bridesmaid can spot the warning signs of a wedding faux pas before they occur – perhaps someone at the party is getting too tipsy or she knows that two guests don’t get along and shouldn’t be placed together in the seating plan. She doesn’t ask much about the day as she’s well aware of what’s coming next; in fact, you’re likely to be asking her some questions to see how other brides have done it. She knows the local suppliers that you should get in touch with, and the ones to avoid – an ideal friend to have around pre-wedding! She’s been stalking the photos of her newlywedded Facebook friends to find some of the best industry professionals around for flowers and décor. She’s set up a hashtag of your surnames after the engagement party and has been using it when adding photos of your wedding planning progress ever since – a perfect memory bank for you to look back on. Double tap for her efforts!